Charles Saatchi and Nigella Lawson have just been granted a decree nisi in the High Court, near finalising their divorce. We thought to mark the occasion with an item that puts former adman Charlieboy in his rightful context: as a celebrated patron of controversial Art. 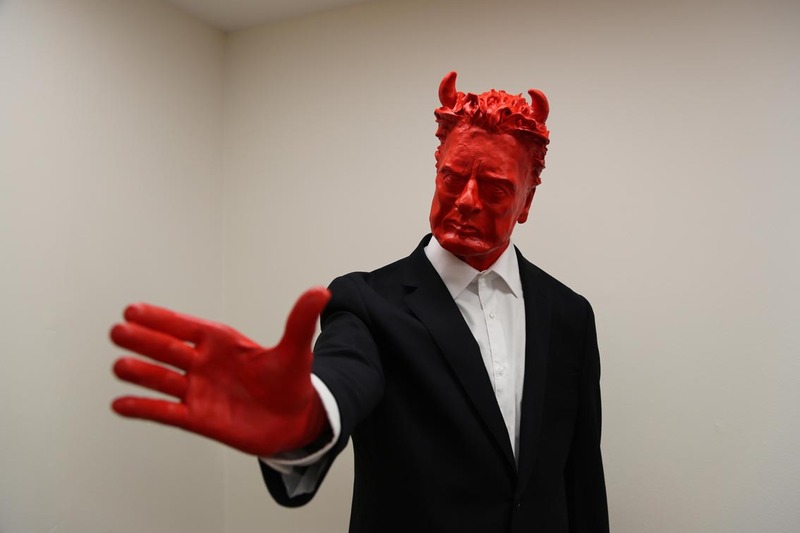 A young British artist (who for entirely understandable reasons prefers to remain anonymous) has created a life-size model of Saatchi with a hand outstretched ready to choke anyone who interacts with the piece. The work is entitled ‘Playful Tiff’ – the words Charles used to describe the incident where he lovingly placed his hand around his wife Nigella Lawson’s neck at Scott’s restaurant in London. Viewers of ‘Playful Tiff’ are invited to place their neck in Saatchi’s hand and capture the historic moment with a photo on their mobile phone. For good measure, and in line with the impish persona Saatchi has used to promote his book, ‘Be The Worst You Can Be’, the model is bright red and comes with a set of horns. The artwork is on display at the Jealous Gallery at Crouch End in north London. We suspect this particular exhibit will soon be occupying pride of place in the Saatchi Gallery.